Karas Kustoms has been in the pen game for a while. They were one of the first companies to do the whole “machined pen” thing on Kickstarter. The original pen, the Render K, was a machined metal barrel designed to fit the polarizing High-Tec-C refill (the market moved on to the G2 refill and now the Render K fits it instead). After that they released a series of pens—the Retrakt, the Ink, and so on. They were all above average pens, but they always felt like pens made at a machine shop instead of pens made by pen folks. That’s not a knock on them—good machine shops like Karas do excellent work, but merely a comment about why some of the pens didn’t hit the target with long time pen fans. They felt more like high end aftermarket parts for an engine hop up than a writing instrument. For EDC fans that wasn’t a drawback but a selling point. For me personally, I like that approach, as it lends the pen a bit more durability, but if you have a collection of MBs your probably not the “tear-an-engine-apart” kind of guy. The Decograph is an attempt to move beyond Karas’s machined pen roots, and to a degree it works. The resin body with beautiful translucent swirls is a marked change from lathed aluminum. The clip, which is a bit wonky, looks the part. And the entire set up evinces details that pen folks can appreciate. The big issue the Decograph faces isn’t skepticism from long time pen people, its from smart shoppers. I don’t normally discuss price or value because value is determined by the finances of the purchaser, something I can’t speculate about, but in this case, when the competition is so fierce, I feel like it is appropriate. This is a very good pen that costs more than some great pens. In a vacuum, the Decograph hits most of the points you’d want in a good writing instrument. The problem is, so do pens that cost $30. This is the age we live in—the Golden Age of Gear isn’t just happening with knives and flashlights. Nope. The pen market has undergone substantial changes too. Changes, in many ways, prompted by Karas Kustoms itself. The logic of capitalism is weird like that. Here is the product page. It starts at $140. Here is a written and video review. Here is my video overview. Twitter Review Summary: Solid entry in the market but too expensive. This is a pretty simple formula—a body slightly tapered at the ends, a bit of metal here and there. The Decograph is a fundamentally solid design, one that old school fountain pen fans would instantly recognize. Their previous pens, for good reason—Karas started as a hop up machine shop for vehicles, felt more like a bored and stroked engine block than a warm and classy writing tool. The Decograph shows that Karas can flex into a different design language effectively and for that, they should be rewarded with a 2. Its not a flashy design, but it is 100% solid. The entire pen is just well made. Every bit of machining shows thoughtfulness and attention to detail. Want an example? The threads on the cap are large and two full rotations will allow you to remove the cap. In contrast, the threads between the grip section and the body of the pen are very fine requiring many full turns. This is exactly as it should be. The cap should come off easily (but not too easily) while the grip should be a more laborious process to prevent accidental removal. Its stuff like this that makes me sure that Karas knows what it is doing. The clip on my previous Karas Kustoms pen, the Ink, was more of a pocket hook than clip. It didn’t actually sit on the pen barrel and the result was the pen that sloshed around in the pocket. It was not my favorite. This clip does contact the pen barrel, but its construction makes it flimsy and easily bent of out shape. Instead of a single solid piece of metal, the clip is actually two piece—the part that connects to the pen barrel and bends down ninety degrees and then the actual straight part of the clip. It is a totally unique form of clip construction and its not great. The small elbow piece has is under a great deal of stress from the long, leveraged “forearm” piece and they are held together with tiny screws. It just looks like it is going to snap in two. Aside from the looks, the clip, while being in contact with the barrel, has very little spring tension. It is not that good an idea and it makes me wonder why Karas has difficulty designing effective clips. It might be time to just make a standard clip and stop trying to re-engineer something that has already been engineered well the first time. The Decograph is a beautiful pen. It is a pen that definitely looks pricey. The green and black acrylic swirl, the facets on the clip, and the overall size and shape convey a sense of class. This is a pen, unlike the horde of machine pens, that looks at home next to a collection of traditional fountain pens. On the appearance front, the Decograph is a hit. The clip feels flimsy and it lacks tension, but it hasn’t broken. The number of parts is kept to a minimum and there is not “parts shedding” like on a TWSBI, so for an acrylic pen the Decograph has held up nicely. It feels less solid than something like the TWSBI Eco, but that is probably more a perception based on the weight difference than any actual ruggedness. Still, I wouldn’t want to take this on a hike or toss it loose into a backpack, like I would with a machined pen, but this is perfectly fine compared to other plastic/acrylic fountain pens. Boch nibs. Oh man, Boch nibs. I am not a fan. Over the years I have used a dozen or so fountain pens and each time I have run into a Boch nib, I can’t shake that nails on a chalkboard feel. The nib isn’t broken and the tines are even, so it is not a lack of function, it is a lack of feel. The nib on my Eco is much smoother, not to mention the nib on something like a Vanishing Point with its golden goodness. If you like Boch nibs, then add a point on to the score here, but from my subjective point of view there are other better nibs out there. Its definitely a trade off, but the comparison between machined pens and arcylic pens is a stark one. Because the parts are so light to begin with, arcylic pens feel more balanced, almost regardless of how they are constructed. When your adding an additional .1 grams to either end of the pen, its hard to notice. When you are adding the same part, but made of metal, the differences are instantly obvious. This pen just feels so natural in the hand, which, in turn, makes the nib choice even more noticeable. With a nice flair just behind the nib and the threading for the cap mostly out of the way, I really liked the grip section on the Decograph. It allowed for hours of uninterrupted comfortable writing. 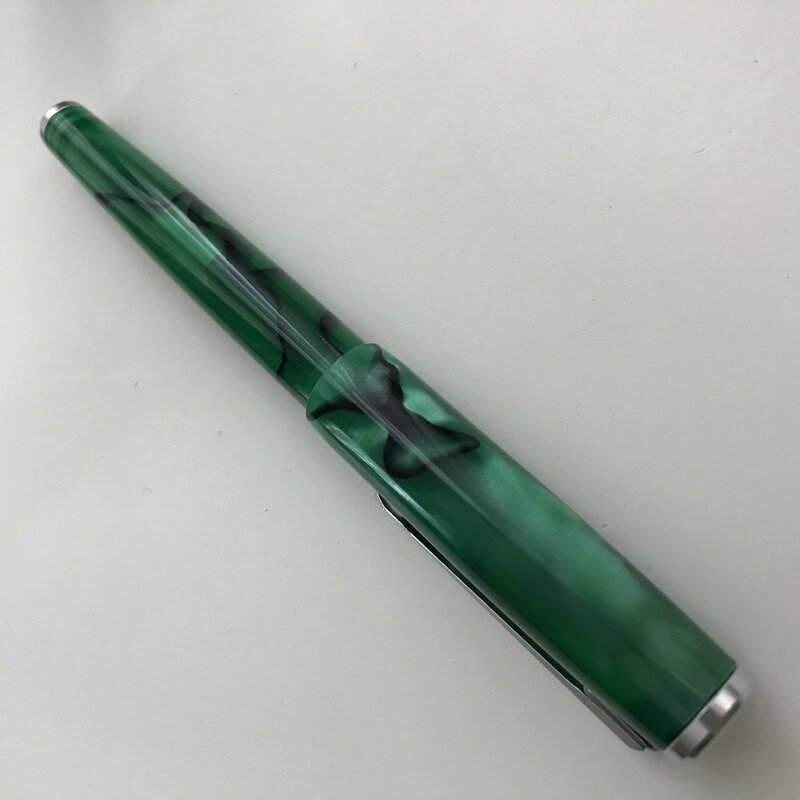 The gloss tube of acrylic with hazy stripes of black mixed with green is really striking, especially coming from a machined pen to this pen. Its not as crazy as some of the acrylic out there (which, for the record, can tend towards spastic), but it is nice looking. One day I will try an urushi pen and see how that stacks up. The barrel is also very comfortable on the hand with no weird textures, baubles or awkward places where the parts mate together. Its just very nice. Thanks to some correctly spaced threads, the cap here comes off easily yet stays in place. I like the look of the cap too with a nice metal finial on top. It strikes me as odd that very few caps come off this quickly. Why I am forced to spend time unthreading caps when a few quick turns works just as well? Karas did a very good job here with the cap, weird clip attachment point not included. The Decograph is a very good pen, well above average. But in today’s uber competitive market, I can’t see how this pen is better than the TWSBI Eco which is about $110 cheaper than the cheapest Decograph. I am completely willing to pay a premium to support a Made in the USA brand or a brand that does great service to the community (or both, as is the case with Karas), but a 400% price premium is probably beyond the limits of what I am willing to pay. If the Decograph was even marginally better, I would be more okay with recommending it, but the nib on my Eco is just better than the nib here. The clip is also superior. Karas should be commended for moving out of their comfort zone. The Decograph is quite nice, for sure, but in the end, as I have mentioned before, the market has created a huge space between good and great. There is a lot of good stuff out there, but the best stuff is both good and an excellent value. I have no doubt that the Gent and the FRN Chaparral will throw off the scale for knives and the Eco has done the same thing for pens. The Decograph is a victim of that scale shifting change.